Looking for a financial adviser or wealth manager? We’d like to help. And there’s one very easy step to get started. Whether you have £10,000, £500,000 or millions to invest, the most important thing is finding the service and advisers that are right for you. As I’m sure you’re aware, there’s a wide choice of firms to choose from – all with very different investment approaches, different working methods, and appealing to different types of clients. Pick the right one for you, and it can make a big difference to your financial future. So how can we help? And what makes us different from other advisers and wealth managers? First, our top priority is treating you as an individual, providing a service tailored to your particular needs. This probably sounds like a bit of a cliché. But here at EQ we’ve spent a lot of time developing a very flexible, personalised approach where we take the time to understand where you are, where you want to be and how best to get there. To give you a bit of context – most financial firms specialise in one particular type of service which they offer to everybody no matter what. For example, some firms provide low-cost ‘robo’ investing, where you pick an automated portfolio. Others offer investment advice. Still others take on full management of clients’ money. Usually you can’t combine these services in any way. With all these firms you sign up for their one standard service and pay a set fee, whether it really suits you or not. These firms don’t adapt to you. It’s up to you to fit in with what they do, even if it’s not perfect. 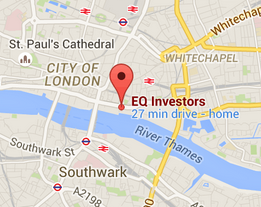 At EQ Investors our approach is completely different. We offer a very wide range of services – all the way from model portfolios to investment advice, to full wealth management – and we can give you just the right option or combination of options, depending on what you want from us. With us there’s no “standard arrangement”. It’s quite different for each individual client. And if you want to change the services you’re using at any time, it’s very easy for you to do so. Your situation is unique. We’re here to understand what you need as an individual, to adapt to your changing circumstances and to help you in the best possible way at all times. As well as our genuinely tailored approach, the second thing that makes us stand apart from our competitors is the size of our team. We’re the opposite of a huge, faceless organisation, where every customer is treated like just another entry on a database. Here at EQ we have a select team of 60 people. I think that’s the right size. When I set up the company, my aim was never to be the biggest firm around – it was to be the best for our clients. And that means keeping our outfit relatively close-knit. We’re large enough to provide you with a comprehensive range of services. At the same time we’re small enough to give you our full attention, understand what you need, and help you achieve the best return on your money. Plus we’re privately owned, which means we don’t have to worry about external financial targets or hitting quarterly sales figures. Unlike many of our competitors, we aren’t obsessed with maximising our fees and profits for shareholders – something which usually happens at the expense of clients. On the contrary, we’re here to do what’s best for you. That’s why I set up EQ in the first place, and that’s how it will stay. The third thing that makes us different is the way that we charge our fees. Some wealth management firms are, in my eyes, pretty mercenary. As soon as you’ve signed on the dotted line there’s an initial fee to pay, and they’re immediately making money from you. And later on if you get fed up with them and want to leave, you’re charged an exit fee as well! We don’t work like that at all. We will charge you an amount each month linked to the value of your investments and the type of service you have selected. If you want us to visit you in your home it will cost more than if you deal with us online but in all cases we aim to be highly competitive. We will only charge an initial fee if we need to do specific work to review your current investments, in which case it will be a simple monetary amount designed to cover our costs, not generate a profit. We don’t make any money from our clients unless they stick with us for some time – so it’s clearly in our interests to make sure our clients are always happy with the service we provide. That’s how we think it should be. We offer our services to almost anyone who wants their money to work harder. Whether you have a relatively modest sum of money (£10,000), millions of pounds, or anything in between, we will create a service that will work well for you. And we’re confident that you’ll be extremely happy with the difference it makes to your wealth. So if you’d like to take it further or have some questions, how do you begin? There’s one very easy first step you can take – and that’s to ring us up for an informal chat. This doesn’t commit you to anything at all. You won’t be talking to a salesman, but to one of our financial advisers or wealth managers. They’re under no pressure to get you to sign up to anything. And they’ll be more than happy to answer any questions you have and explain more about our services, so you’ll understand exactly what we can do for you. If you want to take things further afterwards, that’s entirely up to you. We can talk to you over the phone or via Skype, or if you’d prefer, we’d be delighted to welcome you in for a face-to-face conversation in our London office. (We’ll provide tea or coffee, along with nice views of the Thames). If you’d like to arrange a chat, please give us a call on 020 7488 7171. Or if you’d prefer that we call you back at a specific time, please let us know your details here. Alternatively, if you’d like to have a more in-depth conversation, we are very happy to do that too. And it’s completely free. We’ll answer all your questions. But in addition to this we can help you work out what’s possible with the money or existing portfolio that you have. With a few details from you about your financial situation and your goals, we can come up with an outline of what you need to do over the coming years. Whether or not you decide to use our services, this free consultation will help you be clearer about your financial position and the next steps you should probably take. Usually the whole conversation takes about an hour. We recommend that you come in to our office in London. But if that’s not possible, then it can equally well be done over the phone, or via Skype. Hundreds of people have had this introductory conversation with one of our advisers over the last few years, and they’ve all found it extremely helpful. So, if you’d like to take us up on that, please do arrange a free consultation or call 020 7488 7171. Thanks very much for your time, and best of luck with your investments.